Edit: New wording based on Faust's Suggestion. It no longer has the "while this is in play" thing which apparently is a guaranteed loss in this contest. Just comparing this to Ghost Ship, the drawing is better, and the attack honestly seems better too. Junking plus topdecking, even if it's weak topdecking, is brutal. And it stacks. So if this is going to be a card I think it has to cost at least $5. Maybe $6. It's a Miscreant knight, the attack is similar to Knights but different, can't tell if it's stronger or weaker. Then if no one trashed an expensive card, you get an extra card. I'm not sure having a trashing attack that's also draw is great for similar reasons, it seems really easy to set a deck that can play 3-4 of these per turn and decimate the other players decks. It doesn't even have any safety valve like all the other trashing attacks (Knights dying, Giant being slow and such). And it also attacks peoples hands too! I wanted it to be a $5 cost Throne+ but I think the attack is strong enough that it needs to cost $6. True. I saw it and was like, Man can I just have a chance one week? Yeah, I'll change it a bit before the end of the contest. I don't think a "while in play" effect works with attack typing and reactions like Moat. Also it would need a dividing line like this. I was going for a Swamp Hag kind of thing. I guess I should have taken some wording from there. How is, "Until your next turn, when an opponent plays an action card that produces $, it produces 1 fewer $." How would I word this to make it not stackable? "Until your next turn, when an opponent plays an action card that produces $, they take their -1$ token". 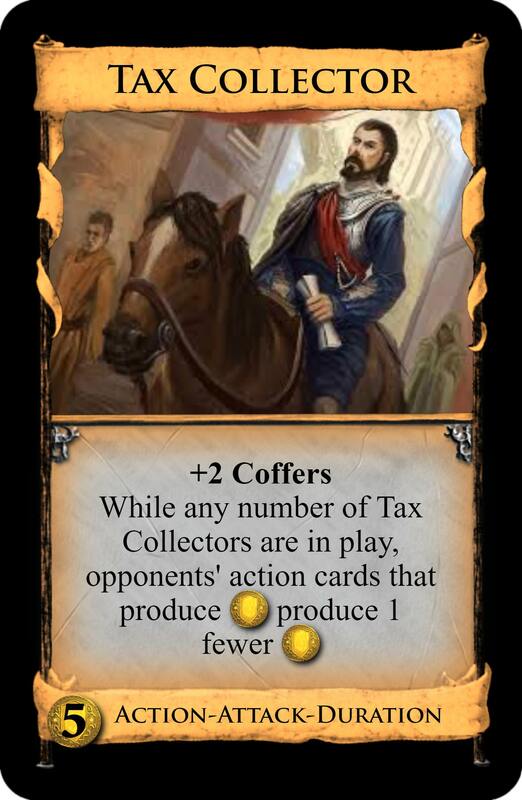 The new wording leads to stacking so I'd stick with the "while this is in play" wording which is the classical anti-Throne wording from cards like Highway and thus totally fine. It's not though. There is a reason that Swamp Hag etc. don't say "while this is in play", because it is unclear whether such effects would be blockable with Moat etc. That's wrong. Moat and Lighthouse say "when another player plays an Attack card", i.e. they care only about the moment the Attack is played and not about what the card actually says. You could e.g. have a Duration Attack that says "in 5 turns, all players get 5 Curses" and while it would be a mess to track Moat would only be able to defend against it if it were revealed at the very moment the Attack card is played. 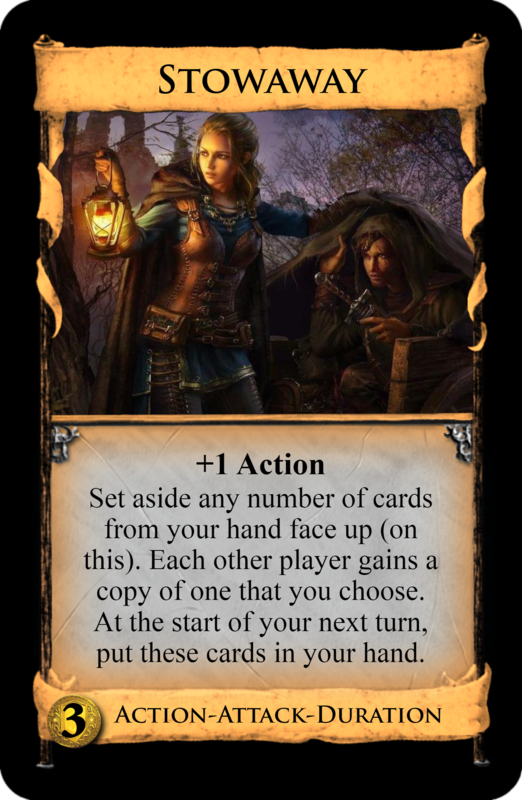 Asper, would you except a faux-Attack card like this? No. I love the little detail of the skulls at the top, though. I also won't accept cards that harm other players without having the attack type (no IGG, Noble Brigand is fine) nor cards that have the Attack type without needing it. +$2. 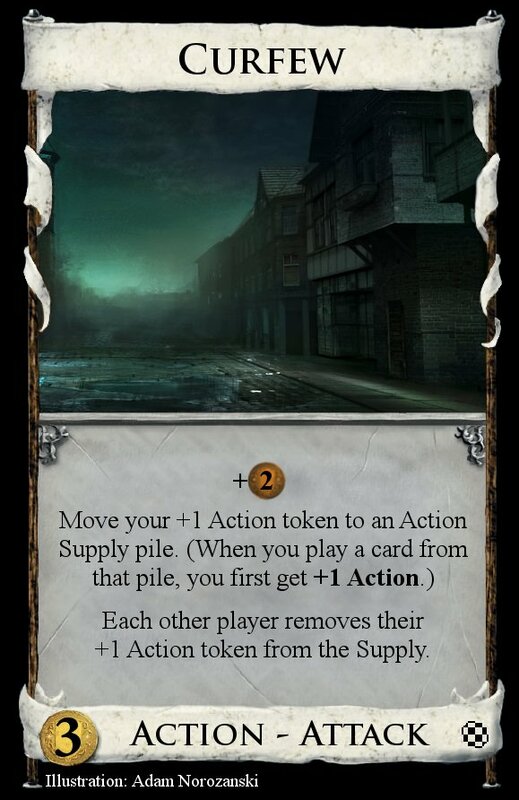 Move your +1 Action token to an Action Supply pile. (When you play a card from that pile, you first get +1 Action.) Each other player removes their +1 Action token from the Supply. Institute a Curfew to get the efficiency you want out of the right people, while everyone else grumbles about it. 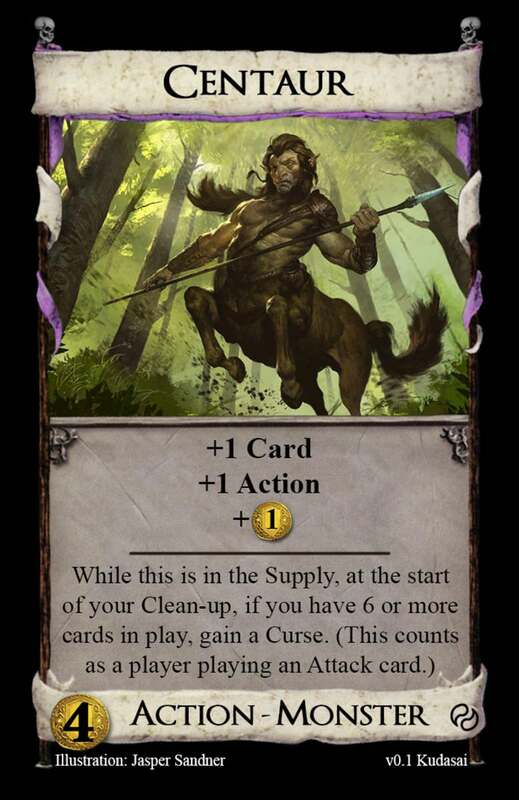 I was always disappointed that there aren't any cards that make the Adventures tokens move about. Early plays of Curfew as you try to build your engine can act as a major thorn in other players' attempts to use that token as you keep pushing it away. Later, multiple Curfews could be used to pass the +Action token around and keep yourself flowing through multiple types of otherwise terminal actions. EDIT: Correction to match reminder text in quote. Additional theme\history\strategy discussion added. But when something appears below a line on a Dominion card, it doesn't happen when the card is played. It's just saying that e.g. a general rule of Dominion is that while a Highway is in play, cards cost $1 less. My gut says if you revealed a Moat when a "while in play" attack is played (assuming the "while in play" is below a line), the "attack" would not be blocked, because you're blocking the effects of the card itself, not the rules of Dominion. Regardless of whether that interpretation is correct, the more important point is that it's very unclear what would happen in that case, so probably best to avoid that situation altogether. 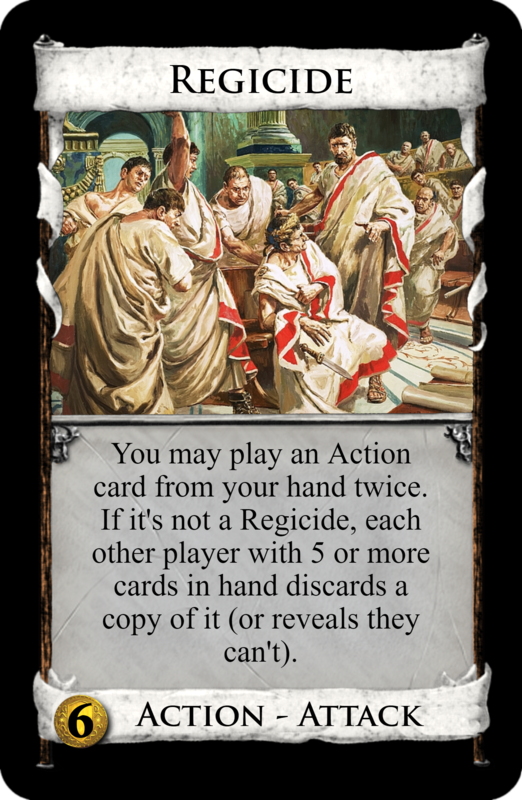 It was bothering me a little bit that Julius Caesar wasn't a king so I changed the art on Regicide to depict the death of Henri IV instead. The player to your left takes this into their play area. During clean-up, you may pay $3 to discard this. If you do not, it stays in play. 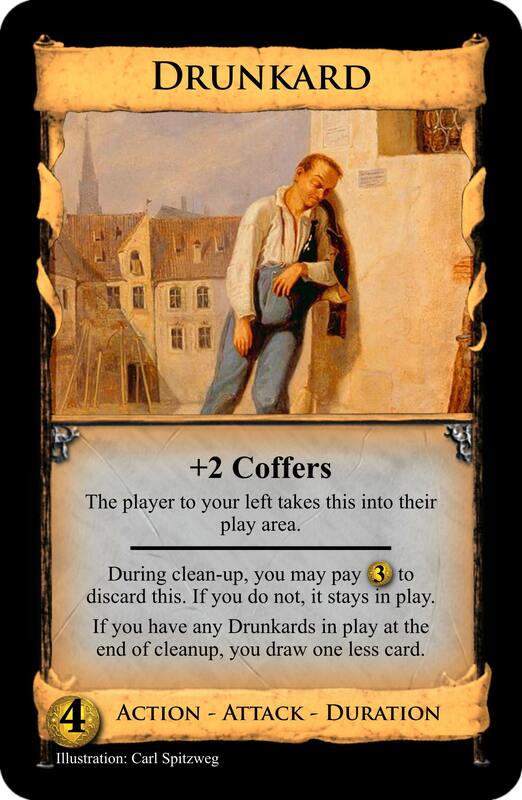 If you have any Drunkards in play at the end of cleanup, you draw one less card. Clarification: Taking the card does not count as gaining it. I'm with scott_pilgrim here. Effects under a line are not triggered on play (they don't even count as "instructions", see Enchantress), and therefore it's highly dubitable they warrent the Attack type. A card without an actual "on play" attack portion has a 0% chance of winning this round. Here is a revised version of Stowaway (also updated in my original post). My initial submission of Stowaway was a Night-Attack-Duration card which was outside Asper's parameters for this week's contest as Fly-Eagles-Fly helpfully pointed out. The Action version is a bit weaker since it doesn't play as nicely with terminal draw as the Night version, so to make up for this, I've made the junking on-play instead of delayed to the duration turn. This is also better for tracking purposes, reaction timing, etc. Now it's Caligula (can you tell I've been reading the Wikipedia article on regicides?). Enforcer - Action Attack, $5 cost. 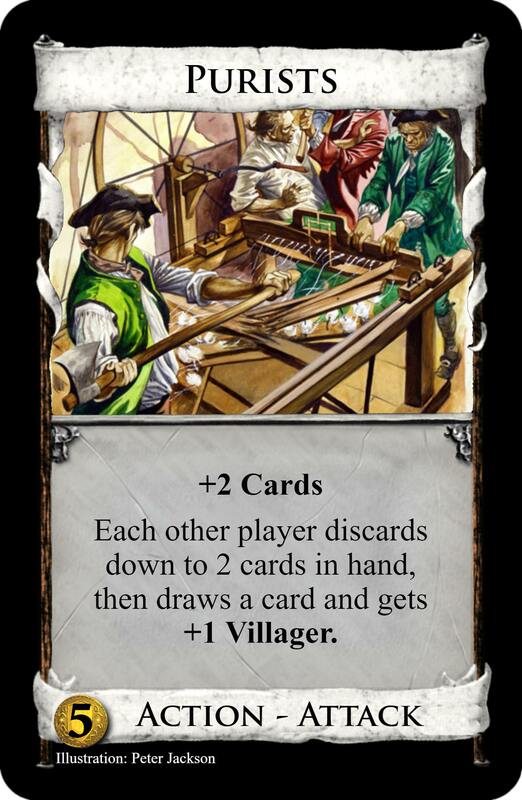 Each other player discards down to 2 cards in hand, then chooses either +1 Villager or +1 Coffers. A person enforcing and rewarding a small hand law. For the avoidance of doubt, do you count "Put this in front of the player to your left" as such an attack? If not I'll remove Drunkard and reconsider. This is great, but the attack is significantly different than what I hoped when worded like this. I don't really see how it would play differently from your original suggestion.